In 1989, LST sent out 58 workers to thirteen sites. Just three summers later, 163 workers read the Bible with people at 27 different sites. Three times the workers and twice the sites in three years, but why? Greater group of mature, experienced leaders, some new and some alums. In addition to these, I believe another factor that contributed to growth was the sudden discovery of LST by the missionaries. LST was such a mom-and-pop ministry throughout the eighties that unless you were a western European missionary, or someone who had met the Woodwards during their mission work in Germany in the 70s, you probably didn’t know anything about LST, nor the unusual method used by LST. That started to change in the 90s. Graduated LST alums spread out throughout the world–that’s one reason. Just like the John Osbornes who carried the LST banner to Japan, others did the same to other parts of the world. An OC student named Ty went to Lisbon, Portugal, with LST. He came home to Dallas with a report that impressed his father, who was one of the key mission persons at a Dallas church that was heavily involved in Brazil. 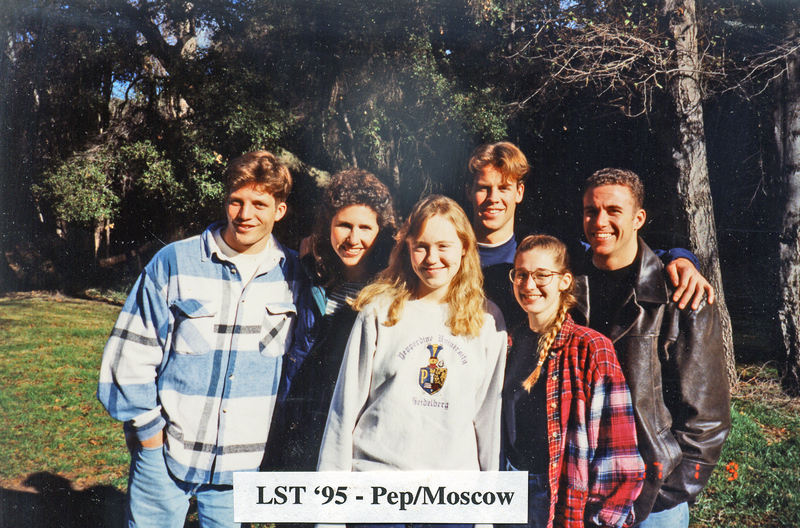 Ty’s dad told the missionaries in Brazil that they should invite LST, which they did, which led to the first Brazilian LST project in Rio de Janeiro in 1992. Pete and Janine Brazle had been a part of LST most of the 80s, but in the early 90s, they became full-time mission workers in Honduras. One of the first things they did after establishing themselves in Catacamas was to invite LST teams to come. We had a long conversation with them and others, including June Hendrix, who was also an LST alum working in Honduras, about whether the LST strategy would work in a small community where half the people were illiterate in their own language. We decided to try, and God blessed the work with so many Readers we had to virtually keep it a secret that the team was there lest they be mobbed by people wanting to join the program. That was 1991. A recent graduate of Michigan Christian had contact with a missionary in Mutare, Zimbabwe, who because of their friendship invited this young man to bring an LST team there in 1994—our first team to go to Africa. One of the great LST stories is about the beginning of the work in East Germany after the fall of the Berlin wall. Gail Mize Nash had gone to Lisbon, Portugal, with an LST team as an Oklahoma Christian student. She returned, got her Bachelor and Masters degrees in Teaching English As A Foreign Language (TEFL) and married Daryl Nash. I approached her one day with the crazy idea of moving to East Germany and starting a language school as a self-supporting mission point. She got excited about it, talked Daryl into at least exploring the idea, so we took a trip together to East Germany in April 1990—just weeks after the borders had opened. In spite of overgrown autobahns, totally neglected parks, streets, and buildings, and barely any government infrastructure still functioning, they decided to move there and open the language school. The second part of our plan was to bring LST teams into Chemnitz in the summer to help the mission efforts of the school in two ways: first, it would attract new students for the school, and second, participating students would have special access to the LST teams which could build the bridge to faith conversations for the Nashes—and those that worked with them. Yes, it wasn’t long until the Nashes hired other teachers to help with the growing number of students in the school . Next, because of the presence of the Nashes and their cadre of Christian teachers, one of the first church planting efforts in East Germany was begun in Chemnitz. Then, as a result of all of these efforts, Larry and Pam Sullivan moved to Chemnitz to work full-time with the emerging church. I believe that Chemnitz, one of the best and most stable works in Germany even today, has hosted LST teams almost every year since 1991’s initial effort. The early stories are all like that. I could tell you about the bullet holes still in government buildings when the first LST teams went into Bucharest, Romania, or the two LST teams we had in Zagreb and Belgrade in 1991, just as the Yugoslavian civil war threatened to break out. These two teams found themselves in two different countries which had broken political ties with each other. We actually had to take the Belgrade team out on a train to Hungary rather than to Zagreb as had been originally booked because of the impending civil war. And I must mention the beginning of LST’s work in Thailand in 1995. I believe the connection came about because Patinya Thitathan, the national evangelist working with the Ramkhamhaeng University Student Center in Bangkok had once worked for the Midtown Church of Christ in Fort Worth where my parents attended. I had heard his name for many years. I honestly don’t remember if he approached me or I him, but what I do know is that it has been a great partnership there for many years now. Patinya was in my office just days ago, talking about needing LST to help with an emerging work in Laos in the next 2-3 years. So these are a few of the stories of the worldwide opportunities that God presented to us in the 1990s. We had no strategic plan for expansion or growth. No, our only plan was to go where we were called and to find others with the same heart and help them go too. Next: FriendSpeak, FriendsCamp, and the move to Texas.